THE NLEX Road warriors began their campaign in the 2015 Dubai International Basketball Championships on a high note, dominating perennial title contender Itihad-Libya, 81-71, on Saturday morning (Manila time). After a slow start, the Road Warriors caught fire in the second quarter behind Asi Taulava and import Al Thornton who started dominating to the delight of a crowd of 3,000 made up mostly of overseas Filipino workers at the Ah Ahli Club. Dubai-based liaison officer Edwin Deang told Spin.ph that NLEX relied on balanced scoring and a deep rotation by coach Boyet Fernandez to get the job done. “Napakaganda ng panalo for NLEX and the Philippines kasi napakalakas ng kalaban. Sobrang ganda ng ikot ng tao ni coach Boyet, halos lahat ng pinasok umiskor and nag-contribute,” said Deang. “Happy ako kasi naipakita ulit natin sa hardcourt ang dugong Pinoy,” he added. 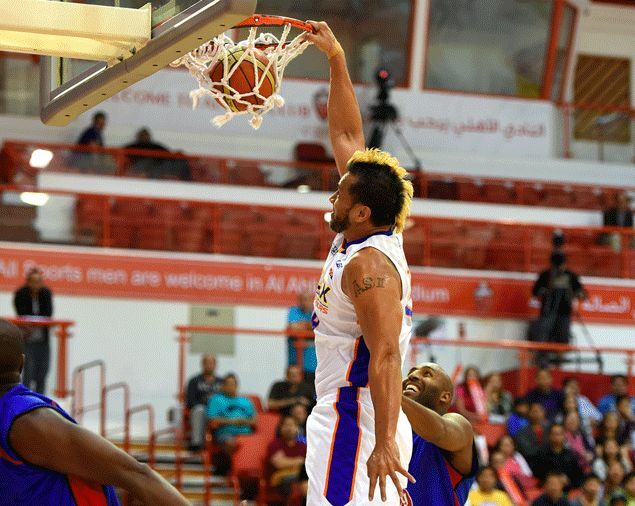 Taulava did not let his fans down as he even made a highlight dunk in front of Itihad’s American imports Deandre Rice and Abdul Aziz Sulani the third quarter to the delight of predominantly Pinoy audience. “That was the highlight of the game. Asi’s dunk totally electrified the crowd. It made us proud. Asi never let us down since the time he first played here with Gilas in 2011,” added Deang. Taulava topscored with 22 points to go with his 10 rebounds, three assists and one steal for the Road Warriors, who opened a double-digit lead by the second quarter and never let up. Thornton chipped in 20 points while Mark Cardona and KG Canaleta combined for 22 markers. Rice led the charge for Itihad with 21 points. After the game, NLEX team manager Ronald Dulatre expressed delight over how their players responded to the challenge of the coaching staff. “I am just glad that they played well. But it’s still a long way to go. The Libyans are just the first step to our mission here in Dubai,” said Dulatre. “But of course, the greater goal here is to prepare ourselves for the coming Commissioner’s cup. The boys are upbeat we can better our tenth place finish in our maiden conference,” he added. The Road Warriors will next face Riyadi-Dubai Duty Free team at 7 p.m. (11 p.m., Manila time) on Sunday.